In this post, Patrick Thomas examines the process of re-configuring the word of God into a multimedia experience for Creation Museum visitors. Each time I have left the Creation Museum, I have felt dizzy and a bit overwhelmed. Part of the reason is that there is just so much to see – dioramas, videos, replicas of archeological artifacts, animatronic people, small live animals, insects, scientific-looking graphs, maps, charts, timelines, and, of course, dinosaurs. This massive visual inundation is bolstered by a raucous blaring of narration, animal and environmental noises delivered by state-of-the-art sound systems. During my second visit, I became more aware as I moved through the museum how these visual and sonic displays direct visitors’ attention. The goal, it seemed to me, was to ensure that visitors had plenty of evidence to see and hear the message of Biblical literalism put forth by the museum. And to be sure, to an unquestioning visitor, there appears to be plenty of evidence to support the Creation Museum’s claims about the literal history of a six, twenty-four-hour day creation. In other words, by creating a constant, immersive, inundating experience at the museum, visitors are so overwhelmed by information that their ability to make connections across rooms, to question displays, or even to understand the placement of (let alone read) each Bible quote is diminished. Visitors certainly get their money’s worth, if “worth” was measured in amount of cognitive overload. And the cognitive overload is powerful for the museum; it’s a way to assert both the factual claim about a six, twenty-four-hour day creation and a way to assuage questions about this claim through the mental exhaustion of visitors. By the end of their time in the Creation Museum, visitors with lingering questions are simply too tired to ask. The multimedia displays stand out to me more than any other aspect of the museum because they draw pointed attention to the artifice that runs throughout the museum. Put simply, the digital technologies used to create visual and aural encounters with creation defy any semblance of the natural world. They are beautiful, but in a way that is high-gloss, plastic, and slick. In displaying creation this way, the museum constructs encounters for visitors that further separate, rather than draw closer, the museum’s historical narrative of creation and the natural world itself. One place in the museum where this separation is especially apparent is the Wonders Room, a startlingly bright space with lots of screens displaying high-resolution images and backlighting that visitors enter upon leaving four previously dark, loud rooms of the museum (the faux-gritty Graffiti Alley, an evening walk in the Culture in Crisis neighborhood, a twinkling lights-laden Time Tunnel, and the IMAX-inspired Six Days Theater). Sounds from the Six Days film, which runs on a loop, are audible in the Wonders Room, which serves as vestibule to the Garden of Eden. On first pass, the Wonders Room is oddly reminiscent of a department store cosmetics counter (compare one to the other). The poster-size still images of contemporary creation appear beside each other, but it’s never quite clear what visitors are supposed to make of these images. Above each back-lit frame of these images, a smaller flat-screen TV displays scientific data alongside still and moving images of nature. In addition to the digital images, visitors see Biblical quotes taken out of context and displayed on screens and other poster-sized display boards (for a more detailed description, see Righting America, pp. 75-77). What’s difficult about the Wonders Room is not just its technologically rich, and hence highly artificial, displays; it is also difficult to discern the ostensible function of this space. Prior to the Wonders Room, visitors are asked to “go back in time” from our contemporary world (signified by Graffiti Alley and the Culture in Crisis room) to the dawn of creation (which was, apparently, videotaped for us to watch in the Six Days Theater). Why not just move visitors directly into the Garden of Eden? And what does this shopping mall-like room have to do with creation? For me, the ambiguity of the Wonders Rooms has an especially important role to play as a lead-in to the Garden of Eden diorama. Specifically, the Wonders Room serves as a space in which images of contemporary nature, in high-resolution and mediated by digital technologies, are invoked as a way to construct an equivalence for visitors between the contemporary and the ancient, between the artificial and the natural. Biblical quotations are posited as descriptions of, if not explanations for, the images of nature that visitors see, and these images are so appealing that they reduce any distinction between the glossy image of nature and nature itself. What happens in the Wonders Room – the room that visitors experience before entering the Garden of Eden – is an erasure, specifically between the story of creation as told through the word of God in Genesis, and the story of creation as shown in the visual diorama of the museum’s Garden of Eden. As a result, what visitors do not see is that, despite the museum’s claim of presenting a literal account of creation, the Genesis 1 story of creation has indeed been altered. Severely so. Quite literally (pardon the expression), the museum takes the Genesis 1 creation story out of the word of God and remakes it in the image and likeness of man. Or, perhaps more accurately, the story is re-created in the likeness of AiG. Setting aside the problems associated with literal readings of Genesis (which writers on this blog have noted often – see a partial representation here, here, and here), what’s crucial to understand about the museum is that the artifice used to construct its representations of the ancient world cannot follow a literal reading of Genesis. To do so, the entire Genesis account, in its entirety, would have to be present in the museum, which it is not. The absence of the entire Genesis story is significant; after all, in a literalist tradition, why would the museum house anything but the Word of God, in it’s full-length glory? If AiG cares about its status as authority on matters of biblical creation, it would be right to acknowledge the interpretive liberties that are absolutely necessary in transforming the creation story told to the creation story shown for a museum-like experience. 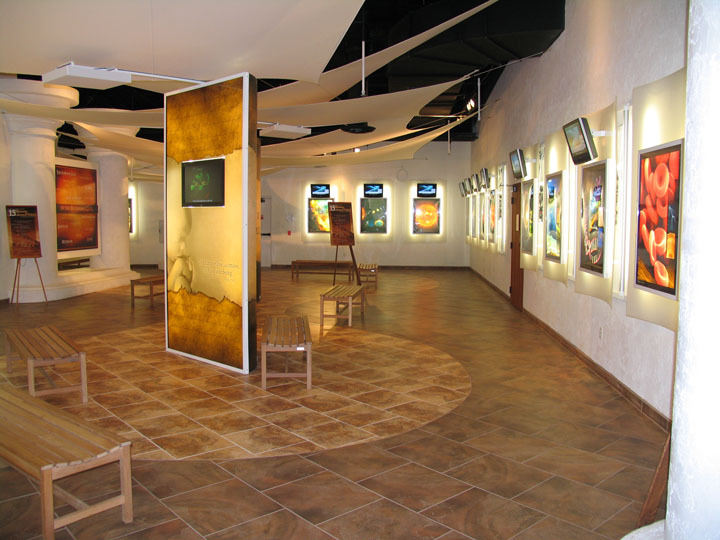 Until then, visitors would be well advised to acknowledge even before entering the building that the story they are about to encounter is the result of countless interpretive decisions, and therefore, to view the museum with a more careful, critical eye toward how the word of God is reconfigured.